dynamic structured snippets. This automated ad extension gives your customers a better sense of the content on your website before they click on your ad. Whether it’s highlighting a list of hotel amenities or top clothing brands, dynamic structured snippets make your search ads more relevant and helpful while saving you time and simplifying campaign management. Over the past few months, many of you have been seeing tremendous success with dynamic structured snippets. And we’ve heard that you sometimes want to customize the information that shows in this format. That’s why today we’re starting to roll out structured snippet extensions: advertiser-provided structured information that show with your text ads. From amenities to brands to product types, you’ll now be able to select a predefined “Header” and input a list of customized values that make the most sense for your business. For example, if you’re a hotel brand promoting hotel property, you can now create a structured snippet for “Amenities” and order them accordingly. 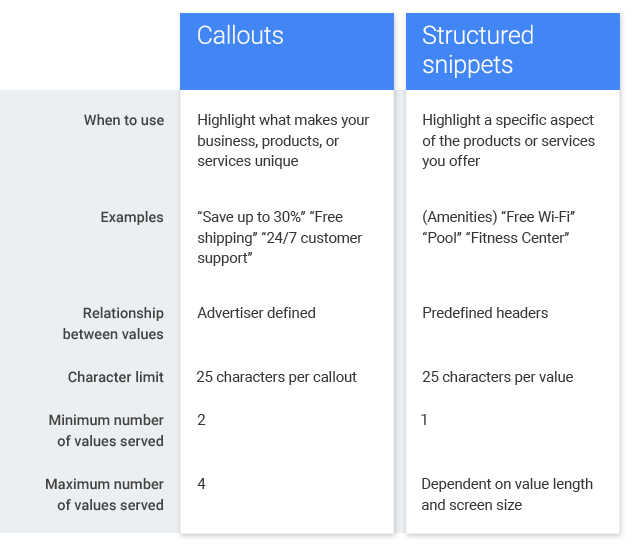 Structure snippets and callouts have distinct attributes and benefits. Structured snippets will be rolling out to all AdWords accounts over the coming weeks. Please note that structured snippets can only be created in English at this time. Ad extensions typically boost the performance of an ad and are also a factor in Ad Rank. Though ad extensions aren’t always eligible to show, the more you provide, the better the auction is at selecting the best combination of extensions to improve performance. 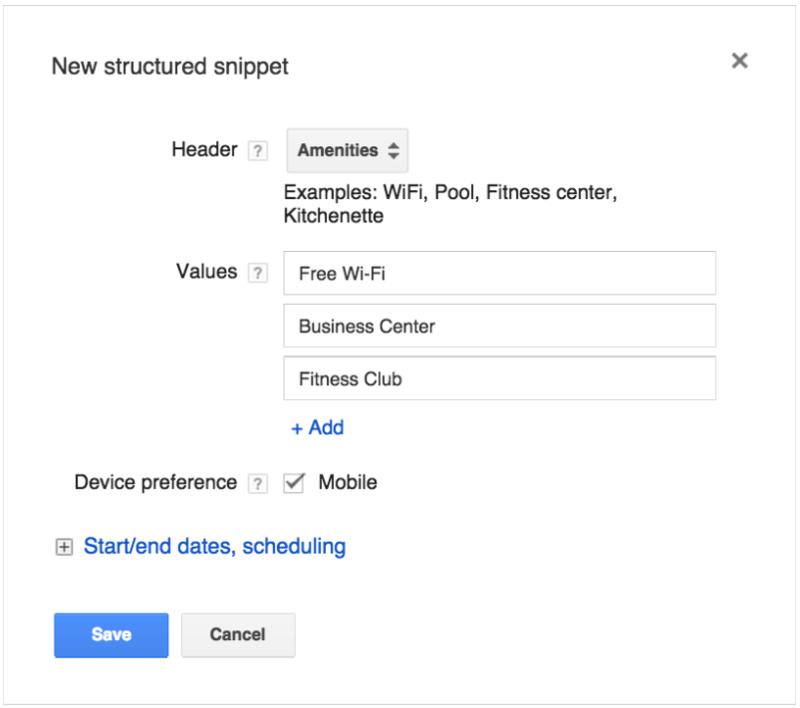 For more information about setting up structured snippets, see the AdWords Help Center. 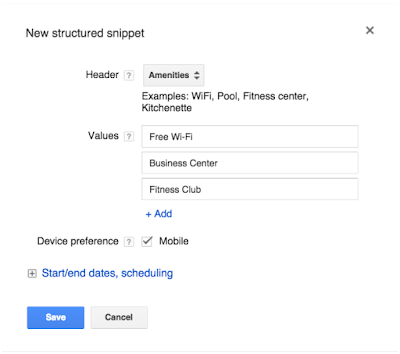 Earlier this year, we introduced dynamic structured snippets. This automated ad extension gives your customers a better sense of the content on your website before they click on your ad. Whether it’s highlighting a list of hotel amenities or top clothing brands, dynamic structured snippets make your search ads more relevant and helpful while saving you time and simplifying campaign management. , the new app install interstitial comes with a beautiful cover photo, a round install button, and matching color schemes. Technology called “color extraction” makes the ads more consistent with the brand's look and feel -- we extract a dominant color either from the cover photo or app icon and apply it to the footer and install button. We found that having a greater variety of designs and colors can improve conversion rate. Other features include the app’s rating, and a screenshot gallery which appears when a user taps ‘More images’, so users can learn more about the app without leaving the ad. The previous design of our app install ads on the left, and our new version on the right. Different examples of color matching. Our app install formats have driven more than a billion downloads across Android and iOS. You can use these new designs automatically when you run a mobile app install campaign on the AdMob network in AdWords. That’s right, no extra work required! Next, our new text-based ads are easier to read, and contain a larger headline and a round call-to-action button that clicks through to a website. On the left, the previous text ad interstitial design, and the new version on the right. As with other ad format innovations, our ads UI team test multiple designs - ten in this case over the course of a year - to find final versions that increase clicks and conversions for advertisers, and a positive experience for users. Both app install and text ad formats appear within the app and can be closed easily, so users can return to what they were doing with a single tap. As we announced at Google I/O this year, the volume of interstitial impressions has more than doubled across AdMob since last July, so now’s a great time to get your business in front of more app users. If you’re a developer looking to learn more about earning with in-app interstitial ads in your app, visit AdMob now. These new designs will also be available to developers monetizing their apps with DoubleClick Ad Exchange. Nearly 60% of smartphone users expect their favorite apps to look visually appealing. We’ve always believed that in-app ads can enhance an app’s overall experience by being well designed. So today we’re announcing a completely new look for our interstitial in-app ad formats - also known as full-screen ads - that run on apps in the AdMob network and DoubleClick Ad Exchange. Inspired by Material Design, the new app install interstitial comes with a beautiful cover photo, a round install button, and matching color schemes. Technology called “color extraction” makes the ads more consistent with the brand's look and feel -- we extract a dominant color either from the cover photo or app icon and apply it to the footer and install button. We found that having a greater variety of designs and colors can improve conversion rate. Dynamic Search Ads are driving great results for businesses, and, as we announced last month, DSA is now more powerful than ever. 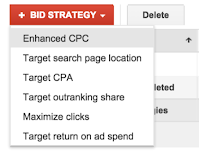 Review the checklist and start optimizing today. 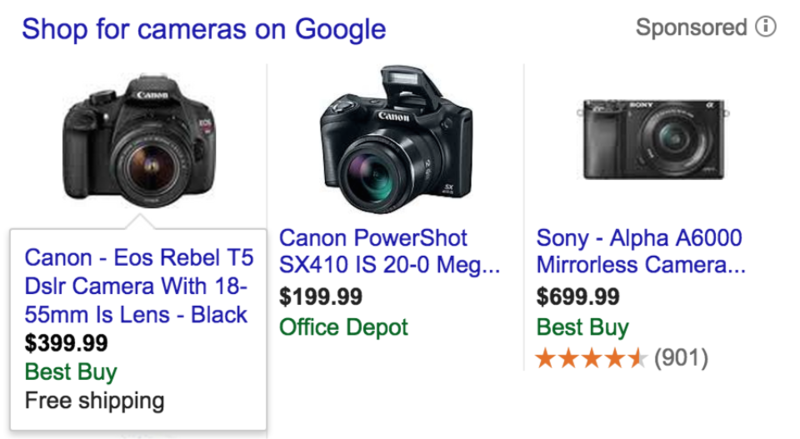 These new extensions are displayed alongside your shopping ads (PLAs) at no additional work or cost. They use existing information you’ve provided in your Merchant Center settings and data feed to automatically show free shipping and price drop information in a consistent and digestible way for shoppers. Based on initial results, we’re seeing shoppers prefer these new automated extensions over promotional text and advertisers are getting better click through rates with it too. Thus, we’ll be retiring promotional text at the end of September 2015 and start surfacing automated extensions more frequently instead. Availability of this extension may vary by country, so check out the above help center articles for more details. You can find more information on automated extensions in our help center as well. We’re constantly looking for ways to give thoughtful, relevant information as shoppers browse, compare and research during their I-Want-to-Know moments. At the same time, we want to help you differentiate your products and stand out on Google. Promotional text, an optional message added to your ad groups in AdWords, was part of our first efforts to do just that. We noticed many of you use promotional text to highlight special offers or free shipping, so today, we’re excited to introduce new automated extensions for shopping ads (PLAs). 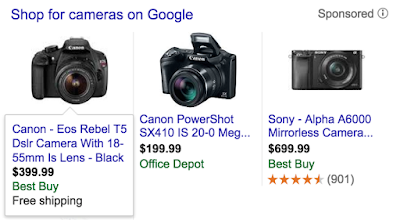 to provide more visibility into the auction and ranking for Google Shopping. Going one step further today, we’re excited to introduce a suite of bidding strategies for Shopping campaigns. These enable you to go beyond manual max CPC bidding to deliver specific bids for each auction, tailored to people’s context. to help you manage your campaigns on the go from your Android mobile device. Now, the app has been installed hundreds of thousands of times in 195 different countries. We created the new billing summary to help you manage payment options, and provide you with an easy-to-see dashboard of your billing and payment information. For example, you can now view payment history, add and update your payment method (add a new card, set up a backup card, or edit an expiration date), and edit your billing profile - all from your Android smartphone. The app now also has additional columns — for conversions, impression share and campaigns — that can be added to your performance tables so you can view and make quick optimizations on the go. For example, if a campaign is limited by budget, you can quickly adjust it. 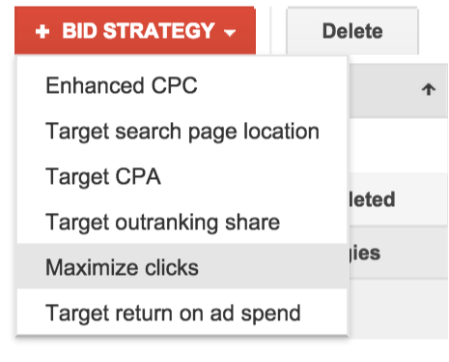 Or, you can monitor your keywords’ conversion metrics and adjust bids in a few taps to help you meet your performance goals. Lastly, the performance tables for your campaigns, ad groups, keywords and ads let you horizontally scroll through more columns to see insights about your performance. 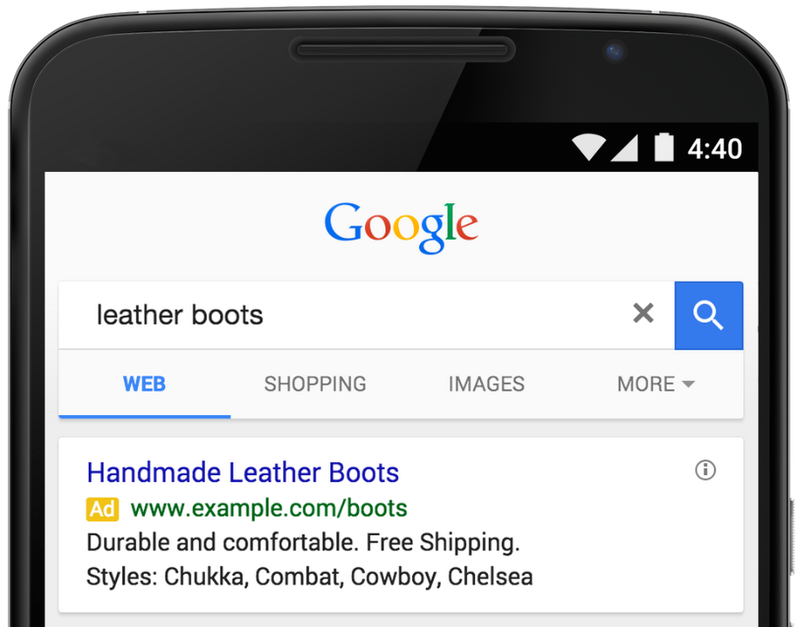 If you haven’t downloaded or used the AdWords app yet, now is a great time to start. The app is available for download on Android from Google Play. Stay tuned for the iOS version. To learn more about the AdWords app, check out this video and visit the AdWords Help Center. We value and listen to your feedback to help us improve the app. Please continue to share your thoughts through the app’s feedback section or on this form to help us shape future updates. In March, we announced the AdWords app to help you manage your campaigns on the go from your Android mobile device. Now, the app has been installed hundreds of thousands of times in 195 different countries. —a powerful AdWords tool that lets you explore your account data in brand new ways from within your browser. The Report Editor provides an easy-to-use interface that lets you build custom tables and charts that can be segmented, sorted, and filtered to help you find the insights that matter to your business. Getting started with the Report Editor is easy. For example, to examine performance across devices, simply drag and drop the metrics and dimensions you like into your table or chart. You can look at metrics like impressions, clicks, and conversions, and then add dimensions like device, campaign, or ad group to segment your data further. Visualizing data in a chart can make your data more actionable. Charts can quickly unveil performance trends that may be missed when looking at numbers alone. Now, you can instantly create a line, pie, or bar chart to surface your key insights. Want to try a different visualization? It just takes a click to instantly switch between different charts and tables. Just like tables, you can save and share your charts with others or set them to run regularly. We are rolling out access to the Report Editor over the next few months. You’ll know you have access when you see the new Reports tab in your account. From the Reports tab, you can open a pre-defined report or create your own report from scratch. 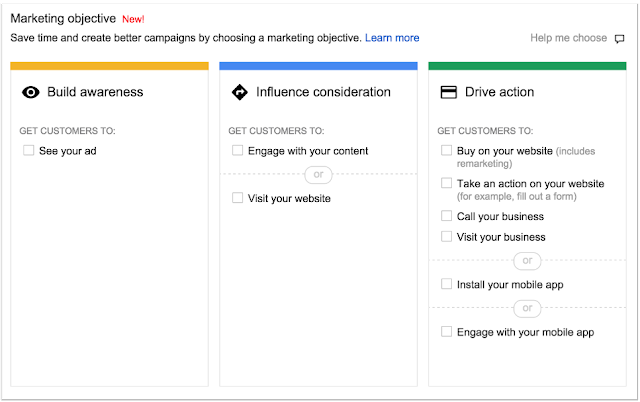 Check out the new Advanced Reporting guide for tips on monitoring actionable insights in your reporting and the AdWords Help Center for more details on how to use Report Editor. Stay tuned for future updates that will let you add even more data to the Report Editor. Over the course of the next few months, we will be rolling out the Report Editor—a powerful AdWords tool that lets you explore your account data in brand new ways from within your browser. 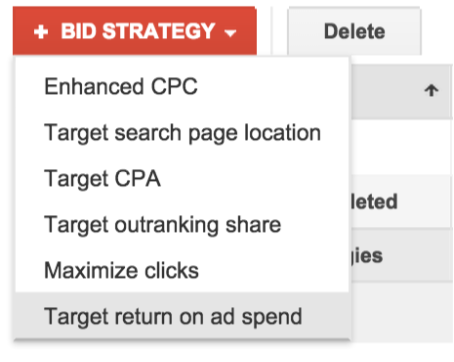 After you select your marketing objective, AdWords guides you to the most relevant targeting and bid settings to meet it. For example, if your goal is to “Build awareness” and get consumers to see your ad, AdWords will show bidding on viewable impressions, which is designed to optimize the reach of your campaign. 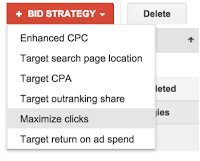 If you want to “Drive action” by encouraging customers to visit your business, then AdWords will show CPC bidding so you pay only when a user is interested enough to click your ad and learn more. We’ve also made it easier to build keyword lists for your Display campaigns when you use the new setup flow. Simply provide your landing page and AdWords will generate keyword ideas tailored to your page content. For instance, if you have a coffee shop, AdWords might suggest “best coffee,” “best coffee maker,” and “how to flavor coffee beans” based on the content of your landing page. 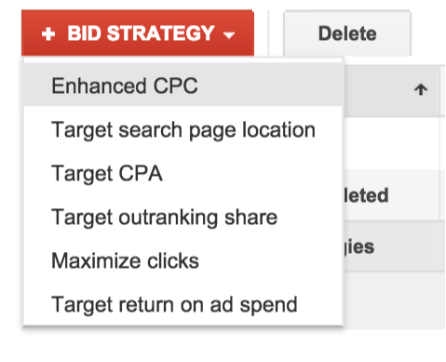 If you’d like to view or change individual bidding and targeting settings, you can do so with just a few clicks. You can also switch marketing objectives at any time or choose to create your campaigns without an objective. It’s now easier than ever to pick the right settings to achieve your marketing objectives. Marketers start every campaign with an objective. Clothing retailers may look to attract website sales, pizzerias want customers to call in orders, and soft drink brands want consumers to be aware of their beverages. That’s why we’re introducing a new, easier way to create Display campaigns that helps you pick the right settings based on your marketing objectives.